Pull your shoulder blades together and slowly raise your chest up off the ball. Raise your arms up off the ball keeping your elbows straight and your arms in front of you. Lower arms and chest slowly. Back extensors, supraspinatus, deltoid, glutes. As your hands get further away from your trunk, the exercise gets harder. Keep your neck straight as you rise up. Pretend you have a grapefruit you are holding between your chin and your chest to engage the deep neck flexors and aid in neck stability. Keep the movement slow and focus on using your back muscles to pull yourself off the ball. Work only within your comfortable range of motion. If you've searched around the internet for this exercise you may notice a lot of people demonstrating this exercise hyperextending their backs. This is not functional and may give some people pain. Just lift until you are straight. This exercise should not cause shoulder pain. If you experience any shoulder pain see your physical therapist. 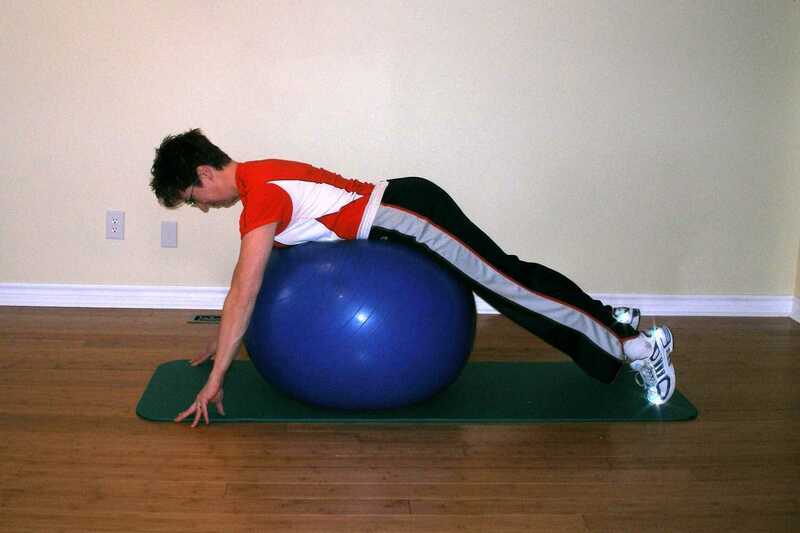 Add some air to your exercise ball to reduce the area of contact your ball has with the floor. If you try this exercise and you find your feet keep lifting off the floor, move the ball a little further forward. If you still have problems, anchor your feet against the wall behind you. if you find you have no difficulty with the beginner version of this exercise, but this exercise is a little too difficult, try putting your arms across your chest and letting a bit of air out of your ball. Bringing your arms back brings your centre of gravity back and shortens your lever making this exercise ball exercise easier. For more information on back exercises click here.